Croatia is nice, but I wouldn’t go as far as crossing off NY. Pula was our third destination in Croatia and one of the more interesting cities, historically speaking. 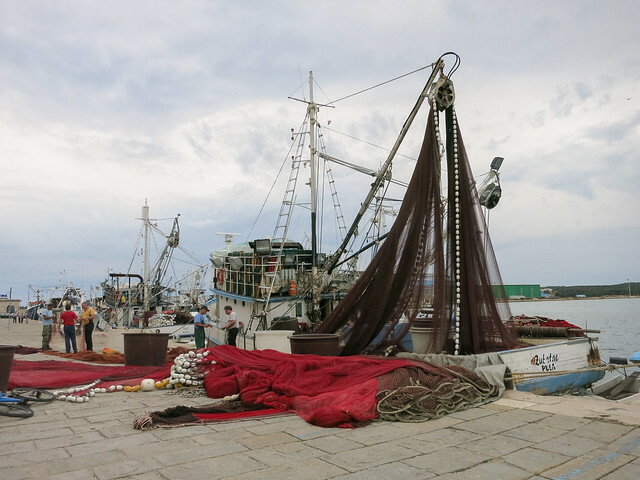 Unlike Rovinj, the action in Pula doesn’t happen down by the water. Actually, there is no action in Pula. It’s a pretty quiet place and we only saw one medium-sized Chinese tour group while we were there. From what we could see Pula didn’t have much of a waterfront scene. 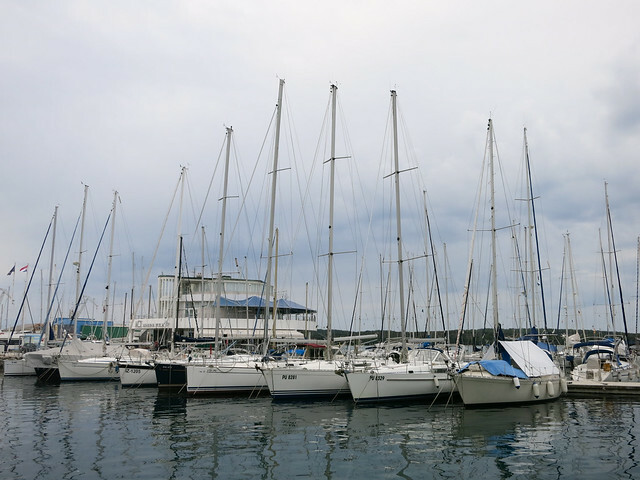 We did walk along the marina area one day and thoroughly enjoyed seeing the fish and fantasizing about how nice it would’ve been to have our fishing poles with us. I’d hate to have to untangle one of those nets. 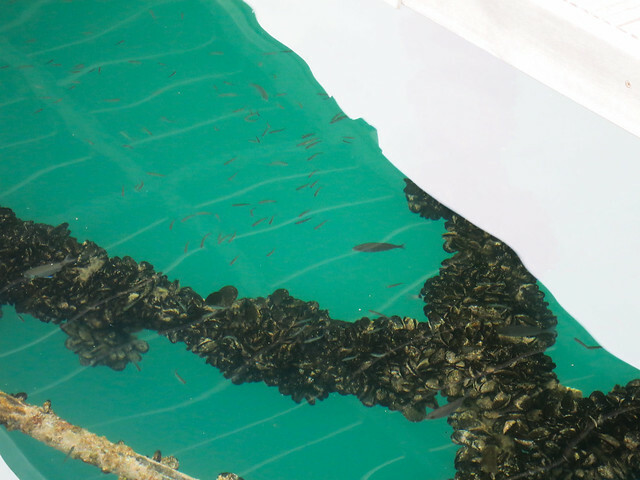 The very, very clear water of the Adriatic Sea. If only we had our fishing poles. 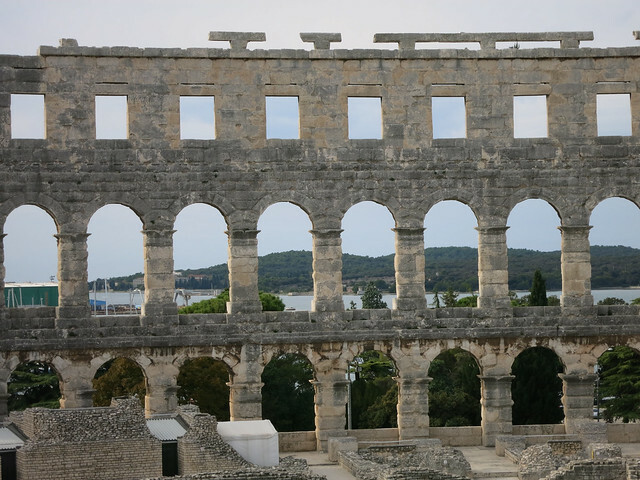 Pula is best known for its ancient Roman ruins including the sixth largest Roman arena and possibly the best preserved of the Roman arenas. 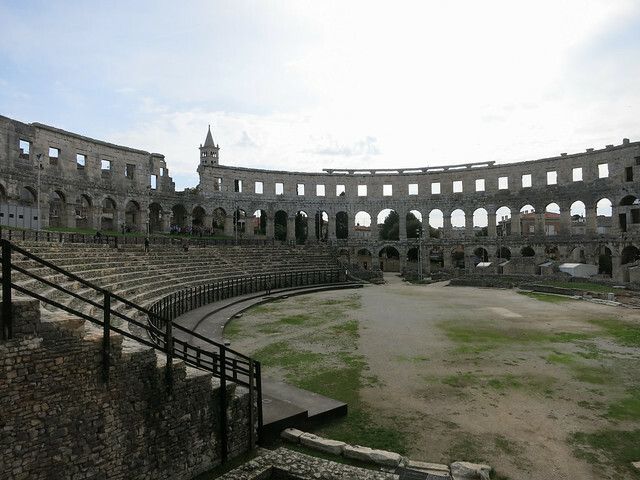 The Pula Arena is the only remaining Roman amphitheatre to have four side towers and all three Roman architectural orders preserved, according to my trusty source, Wikipedia. 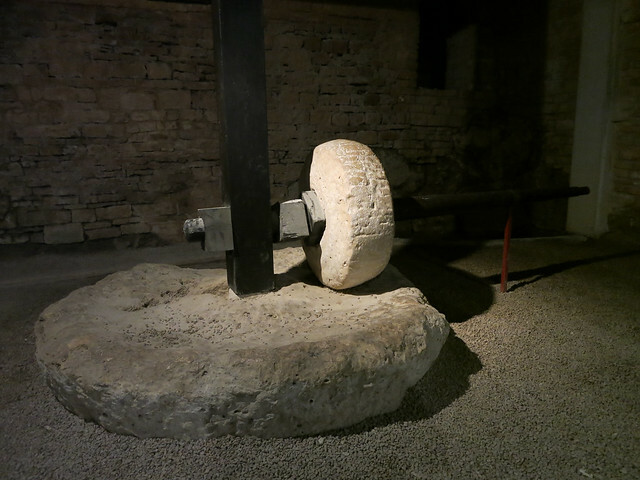 It was constructed between 27 BC – 68 AD and is older than the Colosseum in Rome. 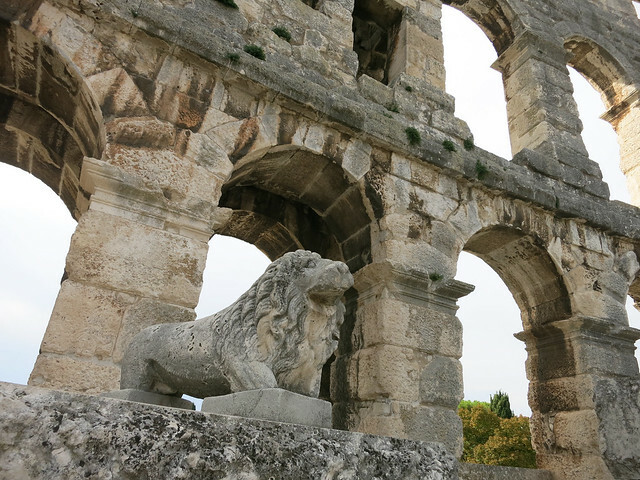 Like other Roman amphitheatres, Pula Arena was used for gladiator combats and fights between death row convicts and wild animals. Nowadays it’s used for concerts; Michael Bolton, Seal, Elton John, just to name a few, have performed there. If I had to choose, I’d rather see a Roman convict fight off a wild lion than see a Michael Bolton concert. As a matter of fact, I’d rather fight the wild animal myself than be subjected to a Michael Bolton concert. 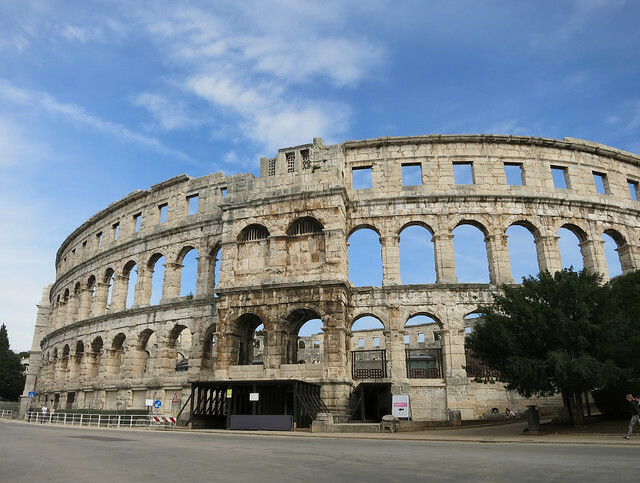 The Pula Arena is the sixth largest Roman arena in the world. This is where I will battle a wild lion to the death! The wild lion that I will slaughter so I can avoid watching a Michael Bolton concert. 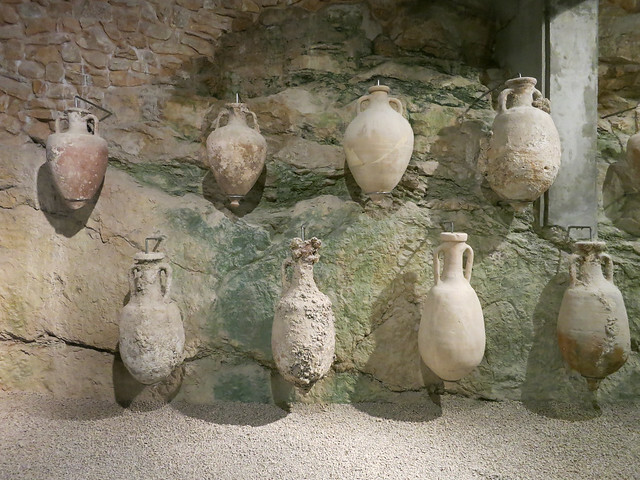 Ancient Roman jars. I think they stored olive oil in them.